Rachel Paul, Parenting Magazine: "Marilyn Van Horne dreamed about her daughter's modeling and beauty pageant career even before 4-year-old Jane was born. Now with a portfolio of photographs, she knows what to look for in a modeling agency." Marilyn Van Horne: "I consider it a responsibility to interview agencies, as opposed to them just interviewing us, basically how they approach you as a potential client, and how they work with my daughter." Rachel Paul: "Though most modeling agencies are reputable, Marilyn says some have tried to overcharge or sell more services than she needs. 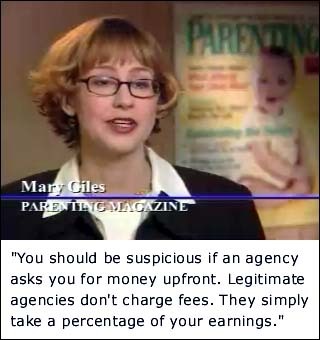 Parenting Magazine says watch out for these signs of a shady operation..."
Mary Giles, Parenting Magazine: "You should be suspicious if an agency asks you for money upfront. Legitimate agencies don't charge fees. They simply take a percentage of your earnings." 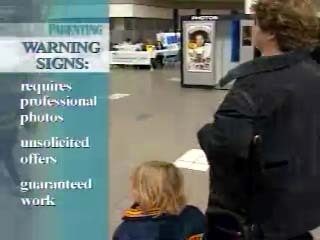 Rachel Paul: "Also be cautious if an agency demands professional photos for children under 5. Responsible ones know that kids' pictures become outdated fast, so a couple of color snapshots should do. You should also be suspicious if you are approached out of the blue. Modeling scouts rarely select kids in the mall or by mail. Most are discovered after parents send a few pictures to a reputable agent." Rachel Paul: "Finally, beware of firms who guarantee a certain income. Though your child may be a beauty queen, it's unlikely that you'll find enough work to earn big bucks." Rachel Paul: "For more information on child modeling scams, log on to parenting.com. I'm Rachel Paul with Parenting Magazine."